Some women love the thought of being surrounded by a full hair and makeup team on the day of their wedding. Others feel that it’s too overwhelming. If you belong to the latter, doing your own wedding makeup on your big day could be the solution. The pros? You have full control over your wedding makeup look without having so many people buzzing around you. 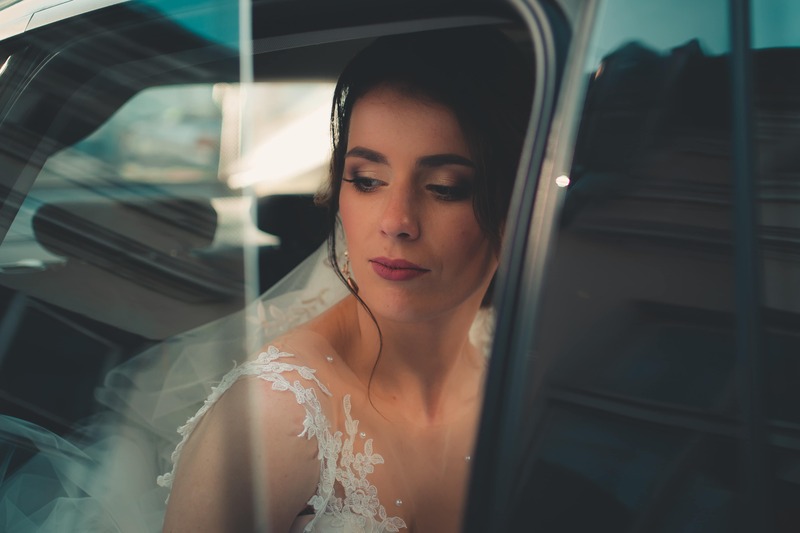 Your wedding day will feel more comfortable, because let’s face it, some makeup teams just add stress to the whole process! The cons? Your wedding photos will stay forever, so you’ll want to look your best — if possible, even perfect! So, if you don’t have much experience with makeup, you could easily create a fail wedding makeup look. Beach wedding? Better go for a lighter look. Is it going to be hot? Better wear makeup that won’t melt. Does your wedding have a theme? Better not stray from it! While considering these three things, be sure to also consider your personal style. Remember, it is your wedding, so you should feel yourself BUT even more fabulous! There’s nothing more attractive than confidence, so if you feel confident, you’re going to look confident on your wedding day. If you’re not used to doing full on makeup, you don’t want to start experimenting on the day of your wedding. To be safe, stick to your usual makeup routine. If you like the lighter, natural look, you can add more edge by emphasizing the eyes with falsies and eyeliner. But, if you’re a pro at the glam look, why not! This is especially important for brides who aren’t used to wearing and putting on a lot of makeup. A trial run is also a great way to figure out what kind of wedding makeup look you want to go for on your big day. We recommend taking photos of the trial makeup look so you can see how your makeup will look on camera. There’s going to be a lot of photos, so better have a look that’s camera ready! One of the WORST things that could happen on your wedding day is spoiling your wedding dress. The rule is to NEVER wear your dress while you’re preparing. So, while you’re doing your makeup, wear a robe or anything comfortable so that you won’t have to cry your eyes out when you spill foundation all over your brand new, designer dress. You do not want to be stressed on your wedding day. Take your time with your wedding makeup by setting aside enough time to do it. An hour and a half should be fine, but if you want more time, you could always allocate three hours for makeup, just to be on the safe side. If you want an easy-breezy experience, go for permanent makeup such as microblading. Your brows will already be ready for the big day the moment you wake up in the morning. You won’t have to worry about your brows not looking like sisters NOR twins. Learn more here.